Mothers usually try to choose for their children the best food. This also applies to the selection of baby puree. Parents consult family forums, watching it on TV commercials, study bright labels in supermarkets. But how to choose puree for the child that it is not harmful, besides the benefits? When choosing baby puree be sure to consider the age of the baby. Puree is fruit and vegetables and even meat. This product is sometimes added to yogurt, milk, cereals and cheese. 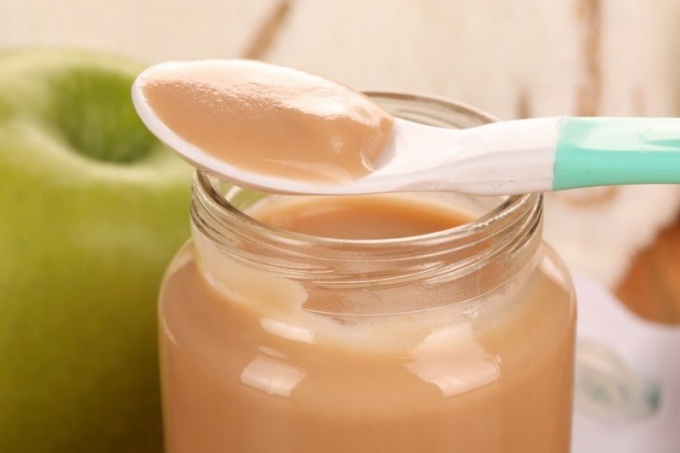 Enter in baby food Apple puree as the lure pediatricians suggest only 3 months. This is the only food that most young children does not cause allergies. After getting used to this product gradually introduce into your baby's diet and other fruit purees: banana, pear, plum. And 4-5 months already feed vegetable and meat purees, and puree with various additives. Pay attention to the expiration date indicated on the lid, on the integrity of the packaging and on the age recommendations. Give preference to berries and fruits that grow in the area where the child was born. Because these products he is used more in the womb and he is less likely to occur allergies. On the label should be specified the shelf life of the product since its opening. Carefully study the composition puree. The ideal would be mashed potatoes, prepared without added sugar, preservatives, dyes and other artificial combinations. This will tell the description of the product on the label mashed potatoes. Children's meals may be approved by the Institute of nutrition of RAMS. For example, the composition of the puree should resemble the following: Apple puree, vitamin C. In this case, the addition of vitamin C to the product is permitted and useful for a child with a preservative, which also has a beneficial effect on strengthening the immune system of the baby. Baby food is usually sold in glass jars and in multilayer cardboard packaging. If the jar is completely transparent, the contents of vitamins when exposed to light decreases over time. While in a cardboard box an inferior product retains its taste and useful properties. So give preference to glass jars, the contents of which are protected from light tight label. Many brands of baby food have established themselves as credible. Population surveys showed that the parents buy baby food from Russian producers, but rather the following brands as the "Theme", "Winnie", "Frutonyanya", "Agusha". However, the experts of the famous program "test purchases" proved that the best Apple sauce was "Semper" because it does not contain starch, and the proportion of dry substances, he is the highest of all the above brands is 15.4%, which is a high indicator of the genuineness of the product. According the parameters "Subject" and "Agusha" slightly behind puree "Frutonyanya". While sauce "Winnie" came down with competitive distance due to the presence in its composition of starch. No matter how impeccable was the purchase of potatoes, the most ideal for the child is that mother will make him independently with the help of a grater or blender without the addition of sugar. In this case, retains all the useful properties of the product. At the opening of the jars with mashed potatoes, you should hear a distinctive cotton. If not, most likely the product is expired. The consistency of the puree should be uniform: no foreign inclusions and uniform in color. The price of baby food does not always depend on the quality of the product. For example, import of potatoes are more expensive just because of their suppliers need to justify the cost of transportation of goods.